63 amp, internal regulator, 3 terminal 3 o’clock position. Tractors: Cub, Hydro 186, 574, 786, 886, 986, 1086, 1486, 1586, 2500A. ALLIS CHALMERS: Remanufactured internal regulator, 63 Amp. 3 terminal three o’clock position. Tractors: 7030, 7040 (prior to s/n 3501), 7050, 7060 (prior to s/n 2513), 7080 (prior to s/n 1469). Use repair kit ARK-4. 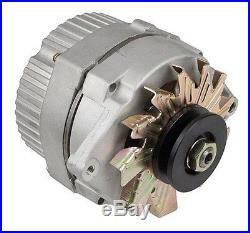 Replaces 266544, 79004866, 9003072 JOHN DEERE: Alternator; TISCO remanufactured. 63 amp, internal regulator. 3 O’clock position. Uses alternator repair kit ARK-4. MASSEY FERGUSON: Alternator, 63 amp. 3 terminal 3 oclock position. The item “ALTERNATOR Allis Chalmers International Harvester Tractor” is in sale since Thursday, June 12, 2014. This item is in the category “Business & Industrial\Heavy Equipment Parts & Accs\Antique & Vintage Equip Parts”. The seller is “justauctions” and is located in Sparta, Michigan. This item can be shipped worldwide.